Osteoporosis can be dangerous because there are few outward signs of the disease. Unfortunately, sometimes people only find out they have osteoporosis after a bad fall. However, certain people are more likely to have osteoporosis. It is important to know the risk factors which, when present, increase your chance of developing osteoporosis. Gender. Women over the age of 50, or postmenopausal women have the greatest risk of developing osteoporosis. 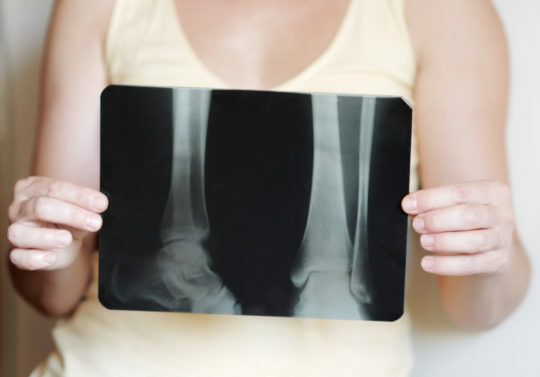 Women experience rapid bone loss during, and 5 to 10 years after, menopause. Menopause decreases the production of estrogen, a hormone which protects against excessive bone loss. Age. Your risk for osteoporosis increases as you age. Race. Women of Caucasian and Asian descent are more likely to develop osteoporosis. Bone structure and body weight. Petite and thin people have a greater risk of developing osteoporosis because they have less bone to lose than people with more body weight and larger frames. Family history. If your parents or grandparents have had any signs of osteoporosis, such as a fractured hip after a minor fall, you may have a greater risk of developing the disease. Nutrition. You are more likely to develop osteoporosis if your body lacks sufficient amounts of calcium and vitamin D.
Lifestyle. People who lead sedentary lifestyles have a higher risk of osteoporosis. Medications. Certain medications result in side effects that may damage bone and lead to osteoporosis. Smoking. Increases your risk of developing the disease. Your diet and lifestyle are two important risk factors you can control to prevent osteoporosis. Replacing lost estrogen through hormone therapy also provides a strong defense against osteoporosis in postmenopausal women. Diet. To maintain strong, healthy bones, a diet rich in calcium is needed throughout your life. Your need for calcium becomes even greater as you age. Lifestyle. Maintaining a healthy lifestyle can reduce the degree of bone loss. Establish a regular exercise program and avoid excessive use of alcohol and tobacco. Exercises that make your muscles work against gravity (such walking, jogging, aerobics and weight lifting) are best for strengthening bones.